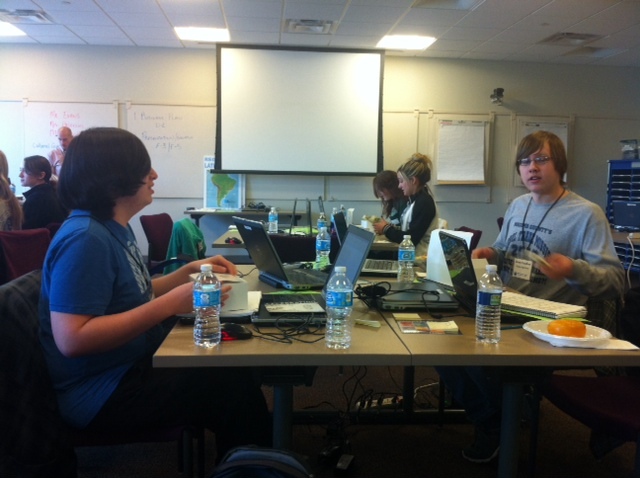 Macomb Intermediate School District students work on their Global Trade Mission proposals. As part of my relatively new position as director of community engagement and editorial training for 21st Century Media’s Michigan Group, and in my role as director of the Southeast Michigan Media Lab, I occasionally get the opportunity to leave our media labs and newsrooms, and immerse myself in the community. Yesterday was one of those days. 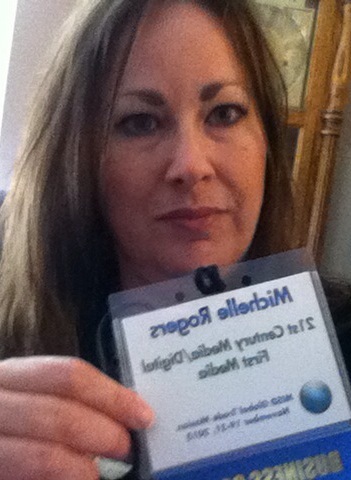 Karen Johnston, career education specialist at the Macomb Intermediate School District, called me last month about volunteering as a business coach at their annual Global Trade Mission. I had met Karen a few weeks earlier through the new Macomb Regional Community Media Lab, which I helped launch with media lab Director Maryanne MacLeod, who also serves as community engagement editor at The Macomb Daily. Karen was enthusiastic about furthering the MISD’s partnership with The Macomb Daily through the media lab, where we offer to train the public in new media and social media as we seek to develop more news-sharing partnerships. Among the companies that industry and cultural experts represented were Ford, Department of Homeland Security Investigations, DTE Energy and U.S. Department of Commerce. I represented 21st Century Media, while Macomb Community College, Henry Ford Macomb Hospitals, Identity Graphic Design, Sensi Change and General Motors sent volunteers, as well. I came in on the second day of the three-day project, and offered help to students in social media, public relations, marketing and PowerPoint. Students were working in small groups associated with a global region, such as Europe, Africa/the Middle East, Asia, North America and Latin America. Coaches were encouraged to approach each group, ask the students about their products and companies, and offer advice and assistance. 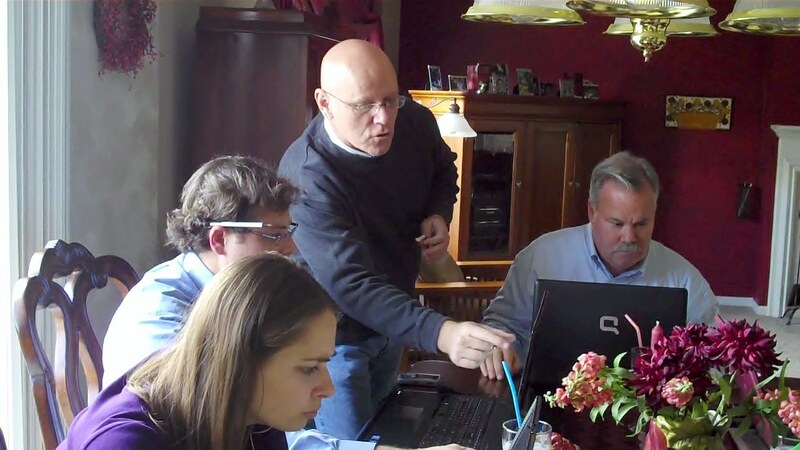 For instance, I helped a group bringing purified water to the Middle East by brainstorming names for their company. They liked my suggestion of Puri-fection, a play on the words promoting their purified water as perfection. I helped another group create its company logo. While I didn’t have experience with the graphics program they were using — and neither did they — we were able to use PowerPoint to create something that met their vision. A third group asked for my suggestions in marketing their product. We chatted about the product, and I recommended a website, a drop-down menu featuring a blog or section for product news and updates, Facebook page, Twitter account and YouTube channel to host their product demonstration videos. I also suggested becoming an expert on their subject and share their blog posts on LinkedIn with peer business groups and with their connections. A highlight of the afternoon was a video presentation by Don Ritzenhein, professor of communication and vice president for academic personnel at Eastern Michigan University. While he has attended in person in the past, his busy schedule prevented it this year, so he created a dynamic video presentation on using PowerPoint. I found it particularly interesting because I create PowerPoints for teaching new digital storytelling tools and social media tools for staff and our media lab workshops, and I’ve never been formally trained on PowerPoint. I learned about a lot I was doing wrong, such as adding to much text to my slides. 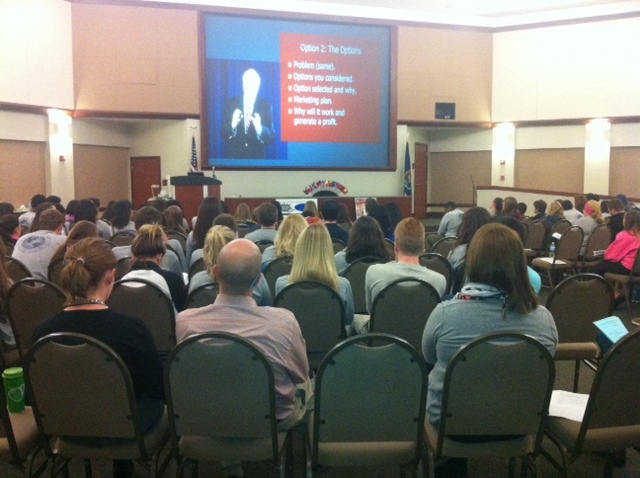 He also provided helpful tips on using infographics, choosing color schemes and presenting in front of an audience. Today is the big day for the students. They will present at 6:45 p.m. at the MISD to various “investors.” Certificates will be awarded by teachers and coaches, and an awards presentation and closing remarks will take place 8 p.m. in Global Hall. While some of our interactions as community engagement editors involve reaching out to our audience on social media, using such tools as polls and surveys, and running contests and stimulating conversations behind a computer, the job also involves getting out of the office and interacting live and in person. The Macomb Intermediate School District afforded me that opportunity and in the coming weeks I have been invited by the new mayor of Milan, Michael Armitage, to train city officials and staff on social media, writing news releases and public relations. Both of these opportunities have inspired me to reach out even more to schools, chambers of commerce, business groups and nonprofits to lend my expertise through this position. After all, what’s more engaging than face-to-face interaction? Oral histories project. Pairing up with local retirement communities and senior centers to gather oral histories from area senior citizens, using ipadio.com’s iPhone “record and publish” application in person or can record phone conversation using ipadio account. Topics based on such themes as community activism, faith and spirituality, innovation, leadership, entrepreneurial spirit, patriotism, cultural influences, heroics/survival stories, interesting careers, community service, service to country, etc. Goal is to train volunteers in the community to record the interviews and provide the photos, so staff only has to grab embed code and receive photo, and then upload to our website under a “Podcast” drop-down menu. In addition, I am partnering with ideaLabber Marissa Raymo and she will use these podcasts/audio recordings for her Senior Central venture. Every Wednesday: Visit Brecon Village retirement community in Saline to interview at least two residents per week. Take their photos and upload to website. 14 Days: Get the same process going in Chelsea and Dexter with help of copy editor Erica McClain. 21 Days: Implement in Milan. 21 to 28 Days: Set up a volunteer orientation session in Saline, Milan, Dexter and Chelsea to train community volunteers. 2 to 3 Months: Implement in Ann Arbor and Manchester and provide training. 3 to 4 Months: Implement in Ypsilanti and Belleville and provide training. I will need the cooperation of staff and will solicit volunteers in the community, possibly high school history students to interview and record. I will utilize our ideaLab iPhone and seek out others with smartphones, but Brecon also has a phone system that can be utilized. At least one or two volunteers from each of our eight communities. Site traffic and buzz on social networking sites. Train staff at sister publications via instruction sheet, but ipadio.com website self-explanatory and offers video tutorial. I could serve as point person and support. Also find attached a spreadsheet of the tools please select the ones you want to learn and prepare to teach. You can post your choice to your idea lab blog. Reporter Gerald LaVaute edits audio for a podcast. My ideaLab report for October is dedicated to podcasting, which I and my staff have learned to do with instruction from Eastern Michigan University College of Education assistant professor Michael McVey. The Saline resident joined me Oct. 20 at Marble Park Cemetery in Milan, where we gathered audio clips at a Trick-or-Treat Tour put on by the historical society. Members of the group, dressed in period clothing, shared first-person stories of some of the local leaders and people of significance buried there. While we used McVey’s fancy audio recorder to gather the audio, it can be done with the iPhone, as well, using “utilities” and “voice memos.” The sound quality won’t be as clear, but it will work. The phone is actually quite functional because you can also shoot photos for a slide show to accompany the podcast, as well as video to complement your written piece. 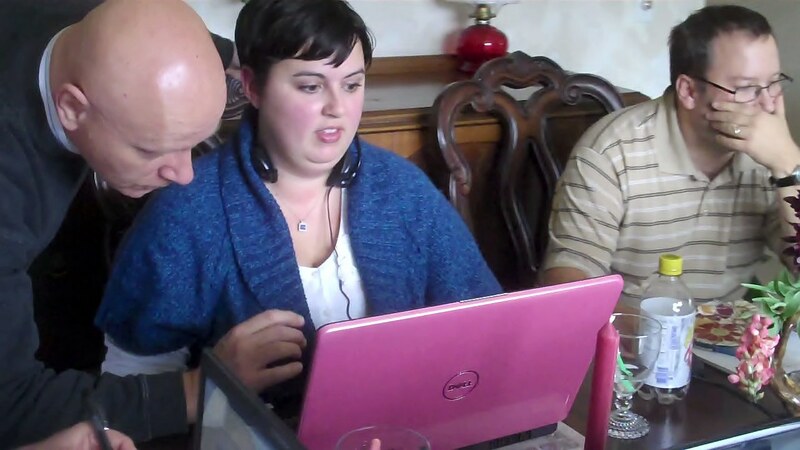 On Oct. 28, I invited my staff over to my home for podcast training. Everyone either brought a laptop or used a couple that I provided. First they had to download free software at audacity.sourceforge.net. Each reporter was given a clip, such as local historian Martha Churchill playing the role of the wife of Milan’s first village president, Nathan C. Putnam, and Lance Smith portraying the town’s late police chief and historian, Warren Hale. 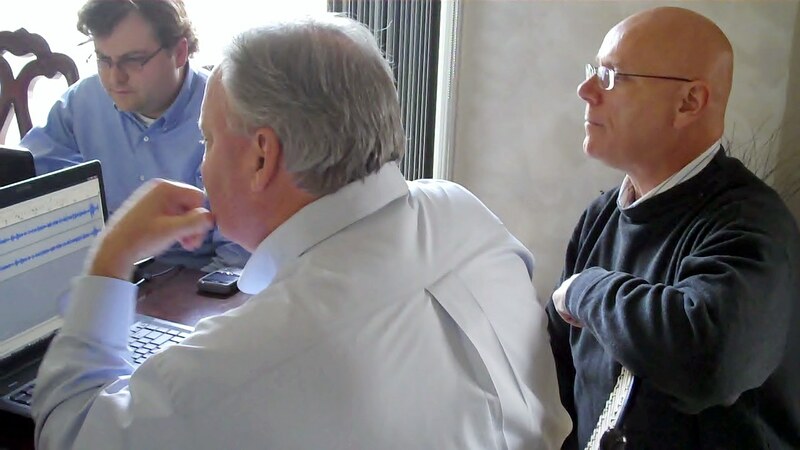 The training went well, as McVey gave individual attention to each reporter, helping them eliminate ambient noise and edit the clips down to under three minutes. They were then converted from .wav files to mp3 using audacity editing software. I will finish the project by embedding the mp3 files and photos in a story and uploading it to our website using our content management system, which allows one to embed mp3s under the “media” section, where photos are uploaded. Eastern Michigan University professor Michael McVey helps reporter Jodie Mason edit audio for a podcast. With that training under our belts, November will see us move on to a more complicated but socially and historically significant project as McVey and I work with the Saline Area Historical Society to record the histories of 10 local historic sites and share the stories behind them. I will shoot current-day photos and the historical society will give us older photos to use as part of a slide show to accompany the audio. My goal is to have this project completed no later than spring. I’d like to have a drop-down menu on our website or a button that can be clicked on, where the podcasts can live forever. After Saline, I’d like to add 10 historically significant sites in Milan, Chelsea, Dexter, Manchester, Ann Arbor, Ypsilanti and Belleville, which are all part of our coverage area, collected by the reporters covering each community. Goal: The goal of this month’s project was to explore podcasting and incorporate it into our news gathering tool belt. I’d like to see our reporters either use audio recording equipment or the ideaLab iPhone to gather audio to incorporate with their news stories online, just as they would gather video or photos to accompany their articles. Podcasting can also stand on its own or may be incorporated in a photo slide show. Allies: My ally on this project, hands down, was professor Michael McVey. He has been very generous with his time, meeting me several times at a coffee shop to go over the details and logistics, and helping to brainstorm the entire project. To learn more about podcasting, check out his podcast on podcasting called “The Considerate Podcast,” which can be downloaded from iTunesU. He also offers tips on the College of Education’s website. Obstacles: Obstacles would be resources. We don’t have any audio recording equipment, but we do have the ideaLab iPhone until next summer. I plan to explore the possibility of purchasing at least one digital recorder for staff to use. Training Needed: We had our initial training with McVey and can do some follow up with him, if necessary, but the audacity software appears to be easy to figure out and you can download a manual. Resources Needed: Resources needed would be a quality audio recorder with a microphone and head set with microphone for editing. Accomplishments: The accomplishment is the training we received and using viable audio that we can incorporate online. The podcasting project from the graveyard tour, once I get in posted online, will be a nice accomplishment, with the crown jewel being a historic walking tour podcast series that we create for each community. 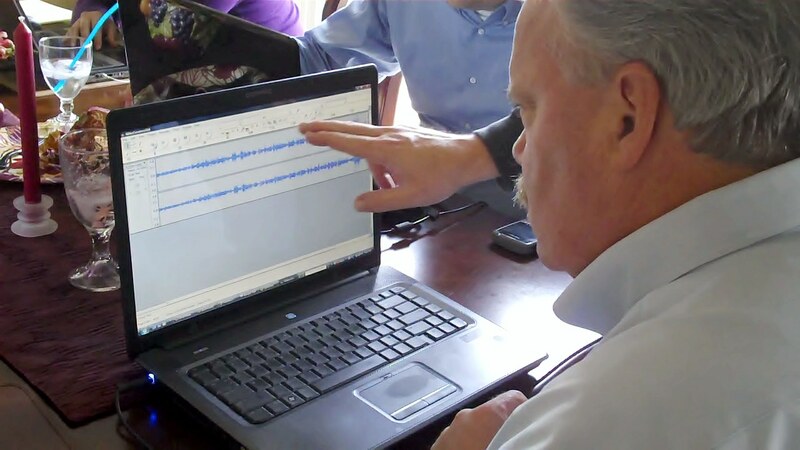 What you’ve taught: With the help of professor Michael McVey, we’ve taught reporters how to edit audio and convert it into mp3 files for upload on our website to accompany articles or photo slide shows. What you’ve learned: I’ve learned how to gather audio on a recorder and the iPhone, edit it using free software from audacity.sourceforge.net, and upload it to our website. Metrics: We won’t have metrics until I get the audio online and see what the response is from readers. Of course, we will promote it on social networking sites and in print. Narrative: My narrative is above.